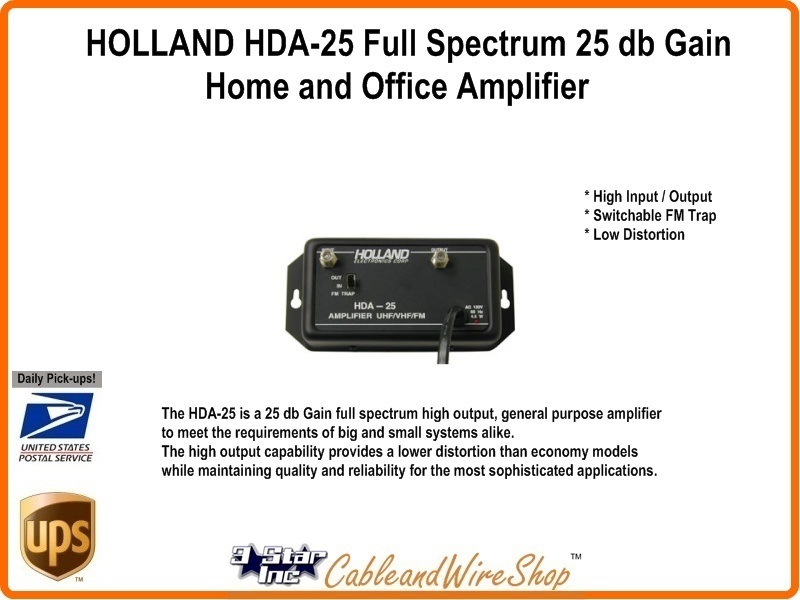 The HDA-25 is a 25 db Gain full spectrum high output, general purpose amplifier to meet the requirements of big and small Home or Office Distribution systems alike. The high output capability provides a lower distortion than economy models while maintaining quality and reliability for the most sophisticated applications. This Amplifier is for Indoor or Environmentally Protected Shelter use only. This Amplifier will serve 4 to 8 TV Sets and associated equipment well. It will not pass return signals associated with Cable TV Pay Per View, On Demand, Hi Speed Internet or other 2-Way Communication Transactions. Note: If you need to Add a couple of HD Ready TV sets to your Cable TV Hook-up, this amp will do fine to Offset the Loss encountered when adding a Splitter To feed the additional Outlets. In addition, it comes with an adjustable Gain control, so you can find that sweet spot and save (in reserve) some gain for future additions and signal Splitter, or balance the amplifier out to feed another amp at the other end of a cable segment to extend your systems reach to another building. It is Forward only (54-1000 MHz), which matches the Bandwidth of any Cable TV System, but will not pass return from High Speed Internet Modems or Pay Per View Converter Boxes. We have Amplifiers that will do that. See Below! This actually makes it good for Antenna TV Signal Amplification in your Home System as well. The Cable TV Company will be happy to Charge you to go through and Re-Install your Home, or you can do it yourself! With HD Digital Signals, the Signal Level is actually lower than the analog, and with increased Channel Capacity, not enough is there to feed your Home. Check Your Picture quality where the Cable TV feed enters your Home, if it's good there, you can replace connectors, cable and Splitter to bring your installation up to the newest specifications. If you are feeding numerous TV sets or long Distances, use this Amplifier before the Splitter Or long cable run to maintain Signal Quality. If the Picture quality is Poor at the Feed point of your House (the Cable Company usually has a Grey box used as a Demarcation Point for this Purpose), call your Cable TV Technician and Demonstrate to him your issues, so he can effect repair.